H.A.L.T. — Hungry? Angry? Lonely? Tired? The world unrelentingly asks us to overextend ourselves. Self-care is praised in name, yet too often, we feel selfish or guilty putting ourself first. In a sea of never-ending external demands, it seems paradoxical to focus on one’s self. However, if we are depleted, whether physically, emotionally, or spiritually, our ability to manage life’s complex demands also becomes depleted. 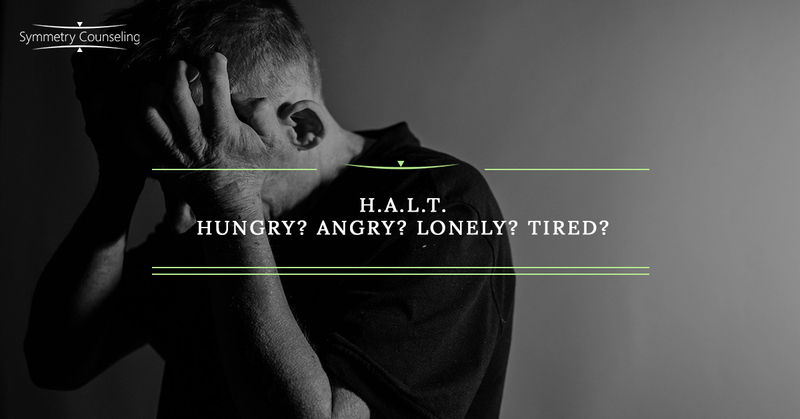 Learning to identify basic physical and emotional cues related to hunger, anger, loneliness, and tiredness is a practical and effective way to integrate self-care, healthy boundaries, and self-awareness into one’s day-to-day life. Busy schedules, financial or health constraints, and diets all encourage us to rely on an external set of criteria to determine what, when, and how much to eat. This cultivates a disconnect from the body’s natural cues related to food and appetite, while also limiting self-awareness related to the way food impacts one’s mood and energy levels throughout the day. During periods of irritability and stress, it’s important to ask, “What have I eaten today? Have I had any water?” Often, a dip into a negative headspace can be stopped by meeting a basic and simple physiological need. We have all experienced anger’s power to overwhelm and distract. Some people describe seeing red when they are very angry, literally such intense emotion that vision, among other senses, becomes impaired. But anger, like most emotions, exists on a spectrum, and often milder anger, or anger with unclear origins, goes unacknowledged. At times, it feels easier to compartmentalize anger, because feeling or expressing anger in the moment could rock the boat in an important relationship. Unexpressed emotions are corrosive to relationships and to individuals in a myriad of ways. In relationships, communication becomes strained and small disagreements grow into painful conflicts that feel impossible to resolve. In individuals, these emotions contribute to a number of physical and mental diseases. If you find yourself becoming short with others or feeling more isolated more often, scan the recent past and identify any situations or experiences that made you angry, sad, or disappointed. Allow yourself to feel the feelings related to the experience, and after the intense emotions pass, contemplate the best course of action, if any, to resolve the situation. while being brave enough to reevaluate those relationships that have become toxic. Establish a regular practice of giving quality time and energy to the good relationships in your life. During difficult times in life, when the temptation to isolate increases, make it a priority to connect with someone else, whether it be a friend, family member, or a therapist. times of irritability or low mood, scan the last few days to see if you’ve gotten enough sleep. If not, make getting a good night’s rest a top priority as soon as possible. If you’d like to learn more about the transformative power of self-care, contact Symmetry Counseling to schedule a consultation with one of our self-care experts.